Fun Picture Books About Jobs and Occupations! We folded and tore the paper so that it would become a square. Then, we folded the paper in half. And then we folded it in half again. Then, we opened up the paper. Then, we folded in all the corners so they met in the middle. Then, we flipped it around. Then, we folded all the corners to the center again. Then, we folded it in half. And put out fingers inside to make our fortune teller! and then choose another number to reveal what you'll be when you grow up. Oh! 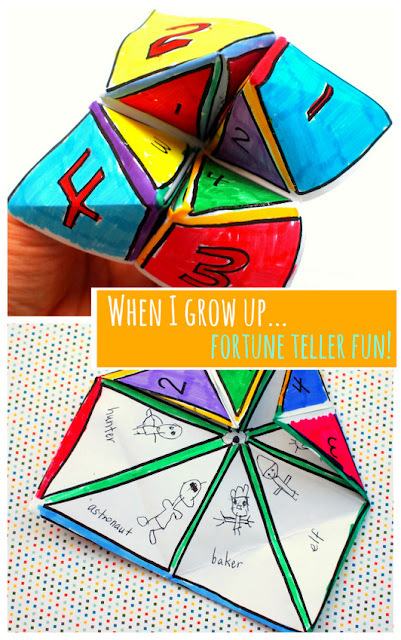 And if you like making fortune tellers, you could also try this Origami Fortune Tellers Book or Mini Fortune Tellers Tin! More Preschool "When I Grow Up" Activities! 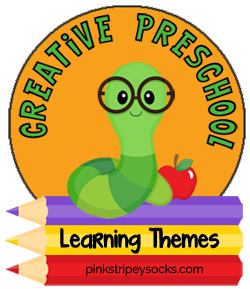 Today's post is part of a collaboration between 6 preschool-loving bloggers! So peek around the other blogs below to find some great preschool activities that encourage little ones to think about what they want to be when they grow up!